He’s been immortalised in live-action films and in animations but, for the purist, Batman will always be—first and foremost—a comic book hero. Making his debut in Detective Comics number 27, in 1939, Batman has gone on to become a cultural icon, whose world is inhabited by the wild, the weird, and the wonderful. For many fans, a continuing frustration is that much-loved storylines are, by the very nature of the comic form, too short—our visits are too fleeting. 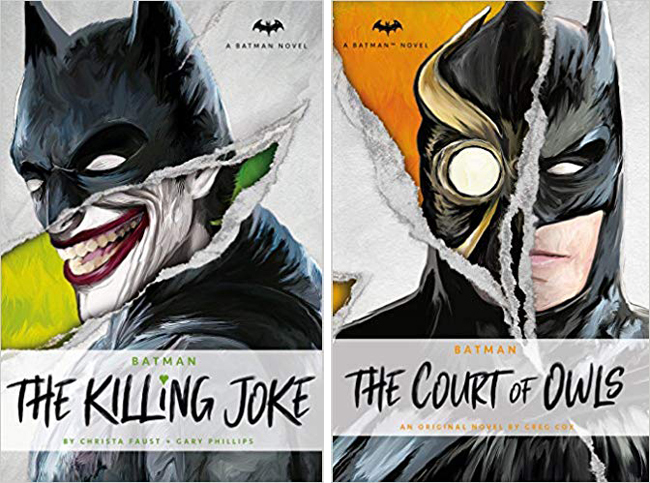 Now, thanks to Titan Books and DC Comics Novels, fans have the opportunity to revisit favourite storylines and explore all-new tales in full novel format. February sees the release of two Bat novelisations. First up is Batman: The Killing Joke by Christa Faust and Gary Phillips, whose retelling of Alan Moore and Brian Bolland’s seminal battle with The Joker, expands and adapts this classic story just in time for the 30th Anniversary. Bringing new insights for both fans of the original comic and those discovering the story for the first time, Batman: The Killing Joke is a rapid-fire ride of a novel, where two eternal foes face off in a world where good and bad—sane and insane—can hinge on one moment of tragedy. 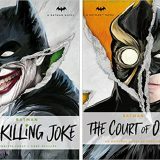 Batman: The Court of Owls by New York Times bestselling author Greg Cox, is a brand-new, stand alone novel set against the Court of Owls—a secret society of wealthy families who have controlled Gotham City for centuries, using influence, money and murder to get what they want. The novel builds on the hugely popular Scott Snyder and Greg Capullo New 52 storyline, and is a tale, very much of the moment with politics and dirty-dealing at the heart of the action. It’s also great to see Batman, once again as the Detective—following clues in the shadows. Batman: The Killing Joke by Christa Faust & Gary Phillips is released in paperback and e-book on 5th February, priced £7.99. 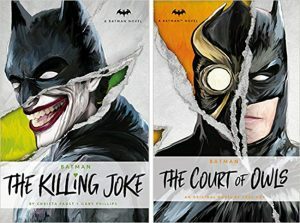 Batman: The Court of Owls by Greg Cox is released in hardback and e-book on 12th February, priced £16.99.